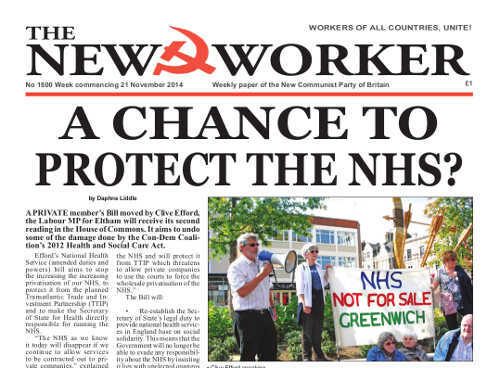 www.newworker.org | 21st November 2014 - A chance to protect the NHS? A chance to protect the NHS? A PRIVATE member’s Bill moved by Clive Efford, the Labour MP for Eltham will receive its second reading in the House of Commons. It aims to undo some of the damage done by the Con-Dem Coalition’s 2012 Health and Social Care Act. Efford’s National Health Service (amended duties and powers) bill aims to stop the increasing the increasing privatisation of our NHS, to protect it from the planned Transatlantic Trade and Investment Partnership (TTIP) and to make the Secretary of State for Health directly responsible for running the NHS. “The NHS as we know it today will disappear if we continue to allow services to be contracted out to private companies.” explained Efford.